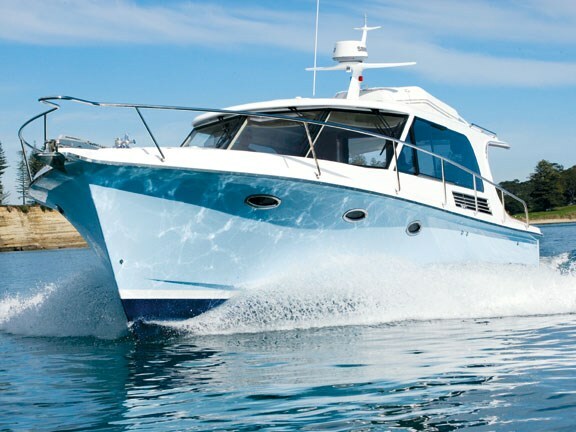 The Salthouse Corsair 44X is the latest take on the classic Salthouse Corsair to come out of Next Generation Boats. Dean and Treena Salthouse, who head up Next Generation, are carving a considerable reputation presenting remodelled Kiwi classics from Bob Salthouse’s (Dean’s dad) original portfolio. 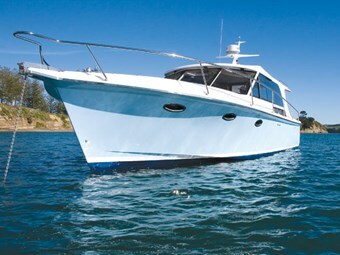 The boat’s owner, Geoff, previously owned a Genesis 360, and had clear idea of what he was looking for in his next boat. 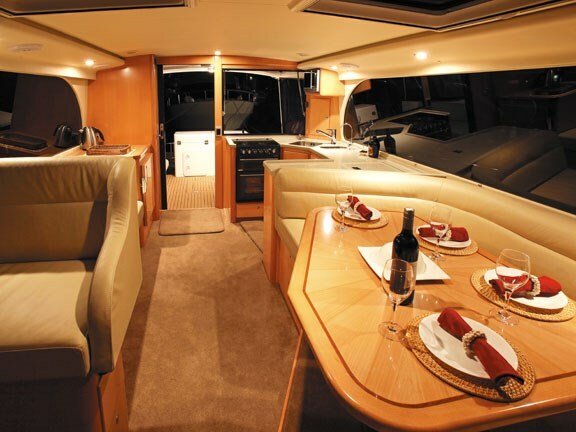 The first criterion he had was a galley located in the aft section of the saloon – a layout style that keeps the chef involved in social activities. Geoff and his wife were also looking for a vessel to get the whole family involved with the experience. The single level format of the Corsair 44 is a nice fit. Our plan was to rendezvous on Motuihe Island for the photo shoot and a BBQ lunch. Making our way through the 12-knot restriction of the inner Waitemata Harbour, the boat maintained almost perfect trim, resulting in very little wake. With a top speed of well in excess of 30 knots the Corsair is an efficient hull. 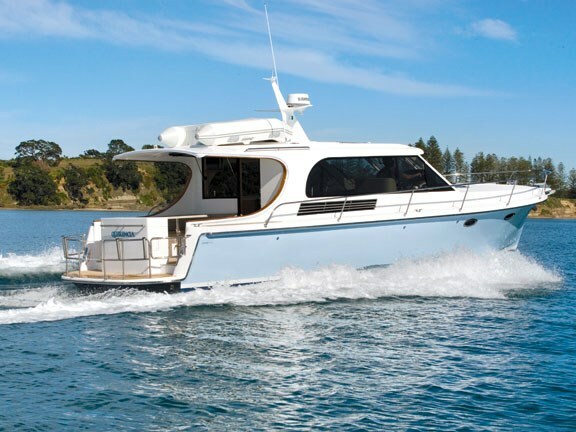 The twin 345hp MTU engines are quality but are a long way of the sort of horsepower that is becoming increasing common in vessels of this size. Internally all the familiar features of the original are present yet improved. The choice of Tawa timber cabinetry is a nice touch. Fitted carpets and quality hardwearing upholstery lend a comfortable and livable feel. Everything has been designed and finished with that Kiwi lifestyle in mind. 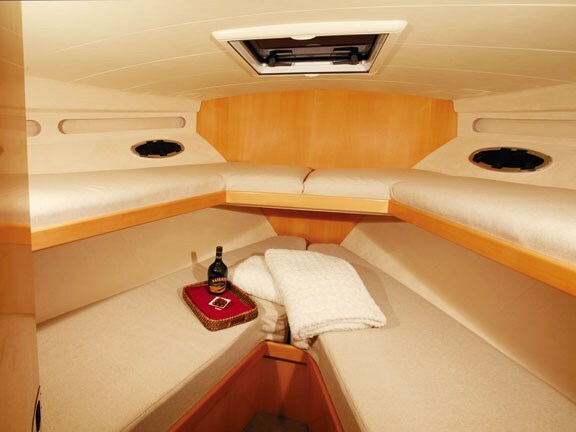 Geoff has opted for the four single berth option in the forward cabin with an additional three single berths in the port cabin. 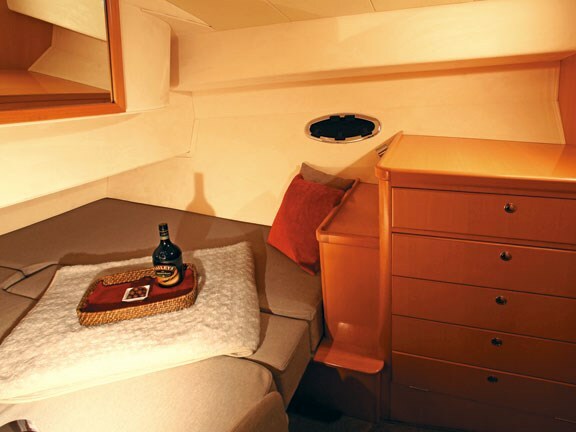 The two floor-level berths in the port cabin can be converted to a double with the use of an insert. There is no en suite-style access to the single head and shower facilities. 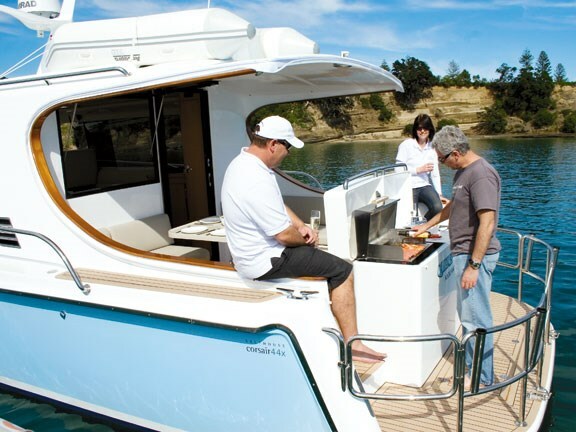 This sort of boat has no need – it is designed for the family after all. The shower and head are nicely finished with plenty of head room and knee room. The U-shaped couch and table is very comfortable and the table is fitted with top quality stainless brackets, allowing it to be lowered to a height that turns the lounger into double bed. 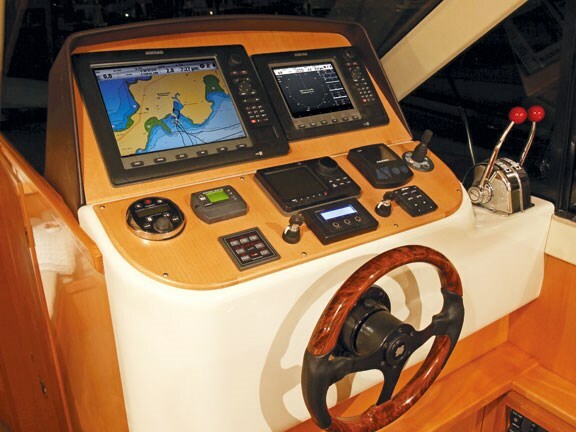 Directly opposite is the helm station – very functional and located to keep the skipper in the action. Visibility is excellent; as it is from every seat in the saloon. Another practical feature is the ability for the skipper to easily climb out the helm window for quick and effortless access to the bow. The advantage of aft-facing galleys, particularly when used in conjunction with the huge fully opening aft window, is that the chef remains part of the fun. Another advantage of the aft galley configuration is the reduced movement this position in the hull has when compared to locations further forward and away from the centre line. Plate and cup holders are purpose-built and lined to prevent breakages, and the full height pull-out pantry is a coup-de-grace for any keen caterer. The Salthouse Corsair 44X has too many excellent features for me to list, but it has to be said that the cockpit is this boat’s real point of difference. 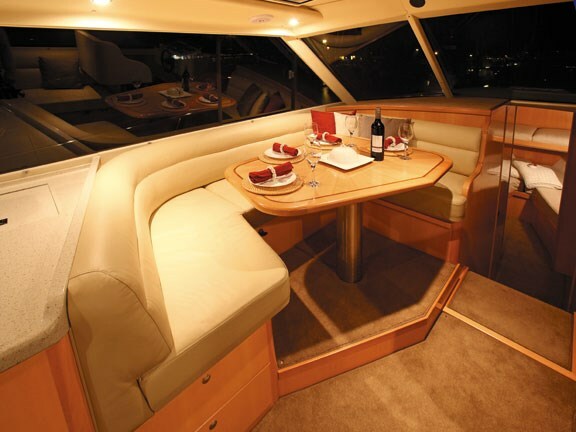 The oversized table and ample seating allows all passengers to dine in comfort. 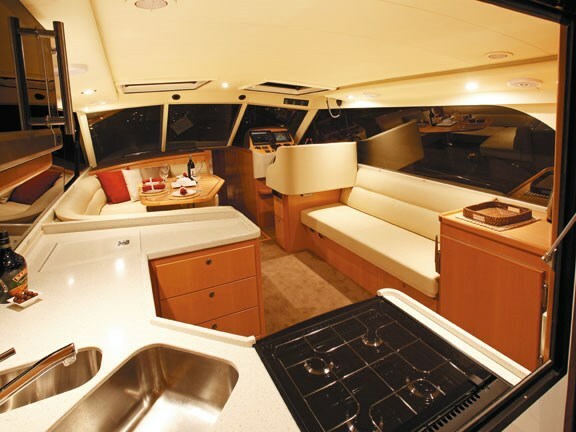 The custom-made BBQ pod on the transom turns this boat into a caterer’s dream. It is easy to use, easy to clean and doubles as a fishing station with a hot and cold water wash-down sink. Other special features are the built-in diesel heater and the removable cockpit clears. The Corsair has plenty of storage for rods, outboards, dive gear, inflatable tenders and just about any other toy you might want on holiday, and no Kiwi-made launch would be complete without the large, open to the water live tank built into the swim step. My skipper’s eye found quality workmanship everywhere I looked, including the wiring. The engine room access (from the forward stairwell) is not ideal but does work. For major work the engine can be accessed via the saloon floor. Under the water, the exhaust outlets are situated a long way further forward than is usual and they vent underwater. The benefits are the reduced costs at installation, reduced noise and fewer fumes. Although this is a twin screw boat, there is only one rudder. The benefit is the greatly reduced drag, resulting in excellent fuel efficiency (at 20 knots she uses 55L per hour). Although I am not a fan of traditional cable morse controls, Dean’s reasoning for installing them is very fair. Electronics can take a while to get used to and many a boat gets bashed on the dock while the owner gets familiar with the lightness of the electronic controls. With cables every movement is positive and has to be done with a certain amount of deliberateness. Pushing the revs up in sync was easy with the digital gauges on the Simrad installation. All the engine data is presented in an accurate and easy to read manner by the NMEA 2000 interface between the MTUs and the Simrad computer. The boat quickly climbed to a comfortable cruising speed of 22 knots without digging in its backside. 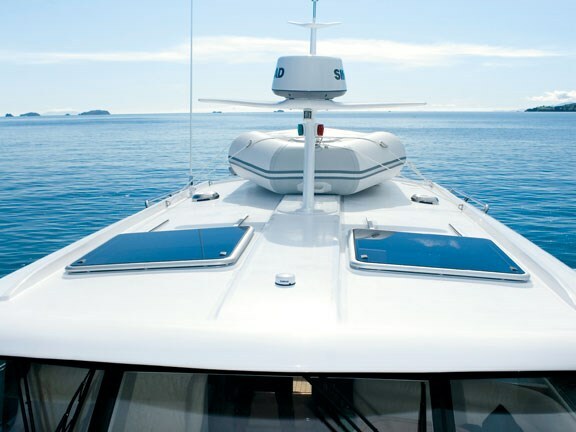 The trim tabs are particularly effective and make very noticeable changes when adjusted, smoothing out the ride in rougher conditions while maximising efficiency on smoother waters. I will say that cornering at speed raised my key criticism of Corsair 44X. The single rudder and lack of lean in the turn have benefits in their own right, but the downside is that the vessel is quite heavy on the helm and does not turn on a dime at speed. On the flip side this boat is incredibly predicable at slow speeds and while berthing. She y tracks perfectly both ahead and astern much like a keel boat, making her very easy to park. With great accommodation and living spaces, plenty of fuel, water, good refrigeration, and that enormous pantry, this is a boat that will give no reason to return early from those long summer holidays – or winter ones for that matter with that nice little diesel heater. As a bonus the fuel bill won’t scare your accountant.